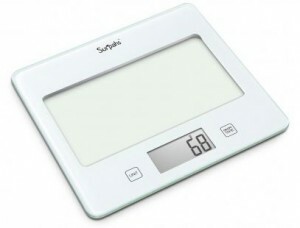 The awesome Surpahs’ food scale you could win! You don’t need to be in your photos, but I’d love to see your beautiful face if you’re good at taking selfies. 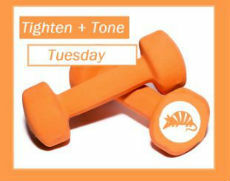 You can enter as many times as you can give proof of yourself being healthy throughout the day. Some photo ops to try: drinking water, eating healthy, and working out. Why would you want to win this contest? Besides the fact that it’s fun to get free stuff, a kitchen scale it a pretty handy tool. I swear by mine. It’s awesome for helping with portion control, which is key if you’re trying to lose weight, but it can also make cooking a lot easier. In Houston, TX it’s pretty humid these days and when I try to measure things like flour, my kitchen scale is waaaaay more accurate than using a measuring cup. It’s also an extremely less messy way for me to cook (maybe that’s just measuring cup user error on my part?). This page comes right out of a Fit Armadillo® meal plan. In the print out, you’ll find basic guidelines that help you compare common measurements to common household objects. A 1/3 cup portion is the size of a tennis ball. A baseball? About a 1 cup portion. If you are using a fitness app to track what you’re eating, you know that you can’t just type in that you had cereal for breakfast. To make sure your recordings are accurate, you need to include the amount of cereal you ate as well. If you don’t want to carry around measuring cups in your purse, this sheet is perfect for you! 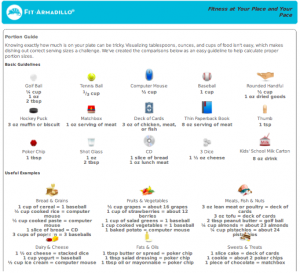 Of course, this guide is just so you have a portable way to track portions. I know you are gong to win the #SurFitArmadillo contest, because you’ll be catching yourself being healthy multiple times a day.